Our company stands tall among the eminent Manufacturers and Suppliers of Automatic Water Level Controller. Easy to install, our Water Level Controllers require zero maintenance. In order to cater the bulk and urgent requirements of the buyers, we maintain a large stock of these in our state-of-the-art warehouse. One can obtain these at affordable rates from us. Motor Control Receiver : Wireless Motor Control Receiver works as switch to on and off Motor Pump. If water Finish in upper tank and there is water in Lower Tank, Receiver starts Motor Pump and now Upper tank full or Lower tank become Empty it will switch off Motor Pump. Upper Tank Sensor (UT) : This sensor will be in Upper Tank. 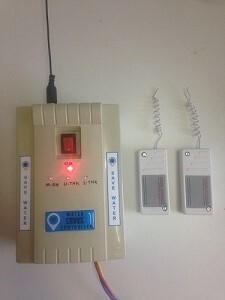 Float and Sensor Both connected to each other. Once tank become completely empty float comes down and goes up if tank is full. According to that Upper tank sensor sends a signal to wireless control receiver. This Sensor contain A Battery with 1 Year Life. Lower Tank Sensor (LT) : This sensor will be in Lower Tank. Once tank become completely empty float comes down and goes up if tank is full. According to that Upper tank sensor sends a signal to wireless control receiver. This Sensor contain A Battery with 1 Year Life.